Migrating to SAP HANA? At #BI2017, Pioneers say that business delight with initial pilot projects paved the way. At this week’s SAP Insider BI2017 / HANA2017 event in Orlando, Florida, SAP customers explained that the key success factor behind their migration projects to SAP Suite on HANA and S/4HANA was earlier successful proof of concept projects that brought big business rewards and built business trust. For Eduardo Pulido and Arjun Venkateswarlu of Mead Johnson Nutrition, one of the biggest success factors for their move to SAP Suite on HANA was the business goodwill generated by an earlier BW on HANA project. The company sells 70 different products including infant formula, in fifty different countries, and is regulated by the FDA. This requires a lot of paperwork and a long and complicated financial consolidation cycle. Each iteration of the cycle took four hours to run, and then the results had to be reviewed by the finance team before passing them to the board of directors. Eduardo gave the example of constantly-changing Venezuelan exchange rates making the process “a nightmare”. 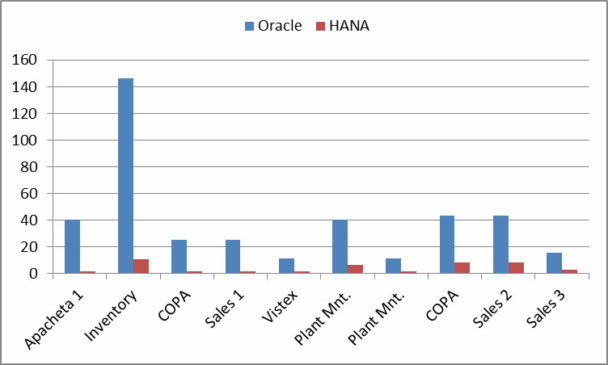 Working with a partner and sample data from the previous year, they were able to show that BPC with BW on HANA reduced the cycle time to just 38 minutes (and subsequent improvements have reduce it to just 15 minutes). Along with the infrastructure savings linked to reduced data duplication and storage, this made the business case easy. The new implementation represented a revolution for the finance team and the CFO quickly reported a 70% efficiency gain in almost every financial process. But perhaps the biggest impact was the change in perception among users of the system. Early in the process, the business had been dubious about the benefits of greater speed, and only started to really understand the benefits once they got their hands on the system. For example, after the implementation one user called to complain that a report on currency exchange effects wasn’t working: “I press enter and the screen just blinks!” The team asked her if she had checked the results — which turned out to be correct. Previously, the report had taken fifteen minutes to run, so when the results came back in just two seconds, she had just assumed that the calculation hadn’t been run. Users throughout the organization quickly started to rely on the new faster reporting and started asking “why doesn’t the same thing happen with ECC?”. Armed with demand from the business and the metrics gathered during the initial project, the team found it easy to create a credible business case for the next stage of migration. The resulting SAP Suite on HANA system has also brought considerable business process benefits. For example, important MRP (manufacturing requirements planning) reports used to take so long that they could only be run during the weekend. Now that can be run during the day, any day of the week, without slowing down the system for other users. Roopa Amin, IT BI/BW Director for Dr Pepper Snapple Group, echoed the advantages of a successful pilot project in order to get generate business interest for more fundamental changes. In a panel session was run by Pat Bresnan and Jon Wingerd of the SAP Chief Customer Office, Roopa explained that the company’s journey to S/4HANA started with the success of an initial BW on HANA project. Dr Pepper Snapple Group sells over 50 different brands of drinks, including 7 UP, Orangina, and Motts juices. But a complex supply chain meant it was hard to get sales visibility, because an individual store typically received deliveries of their products from several different bottling companies. A new multi-million-dollar project was put in place to report sales down to the granularity of each SKU in every store, by supplier, by day. This was projected to double the size of their existing BW warehouse to 25TB, and lead to unsustainable data load times. 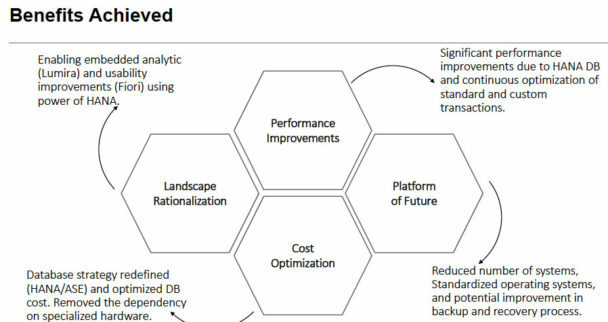 SAP HANA was the clear winner of a proof of concept to compare different options, and reporting speeds have dropped dramatically after moving to the SAP HANA environment. For Varian Medical Systems, the successful move to Suite on HANA paved the way to S4/HANA. Varian Medical Systems’ products treat over 100,000 patients a day, with radio surgery and proton therapy solutions that “focus energy on saving lives”. Varian’s IT Director, Manish Das explained that company does not have a heavy volume of transactions, but the complexity and configurability of the products leads to extremely complex business processes. For example, managing the backlog of demand for the company’s products is extremely important, but the process of projecting that backlog used to take up to 48 hours. 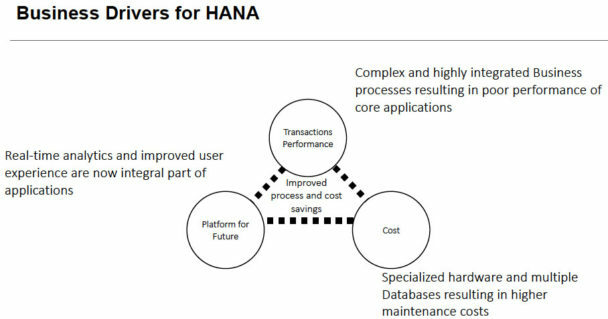 With the move to SAP HANA, hardware costs have been reduced and some jobs now run 10,000 times faster. Varian is now in the process of migrating to S/4HANA to get more real-time views of finances and inventory, and a more intuitive, Fiori-based interface for business users. 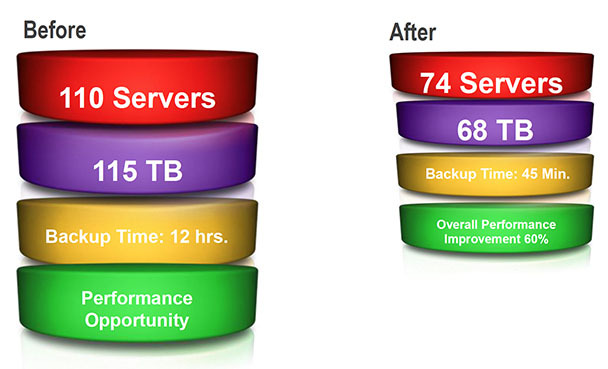 Once unexpected benefit has been in the area of disaster recovery. Previously, this was handled by a third party, with a recovery time of 24 hours. With the move to S/4HANA, it has been brought in-house. This has not only brought big cost savings, but the recovery time has also been dramatically reduced down to just 15 minutes. The examples above show that exposing business users to innovation in a very real and pragmatic way is an essential step towards overcoming the natural fears of business disruption for larger migration projects. The good news is that it’s now easier than ever to give users access to live systems, using their data, without having to beg for large upfront capital outlays. Solutions such as the new downloadable SAP HANA Express Edition allow you to create free production solutions that can even be run off a powerful laptop. And the SAP Cloud Appliance library lets you try out solutions for only the per-hour costs of using the underlying cloud platform. Your business needs your helping understanding the benefits of these new technologies — use these free resources to make it easier for them!